The predictions made by Nnamdi Kanu prior to his arrest have began to manifest. Nigeria was said to be an official Islamic state currently presided over by an Islamist president (Muhammadu Buhari) and his co-Islamic fundamentalists strategically placed in the various agencies and arms of the government, while many of them in their overzealous bid to do the will of Usman Dan Fodio of conquering the Biafran people and imposing Islam had gone as far as raising islamist mercenaries under the cover of Herdsmen. The likes of Nasir El-Rufai are bent on achieving the evil machination of islamizing the entire country. He admitted to this when he stated how he had a contact with the Islamic terrorists under the pseudo name “herdsmen”. He admitted paying some cash and other logistics to appease them from wrecking further harm on Christians in Kaduna State. Contrary to Nasir El-Rufai’s claim, the money and logistics he gave the Islamic terrorists motivated them to kill thousands of people more in Southern Kaduna and Biafraland. When the alarm was raised, their fundamentalists in various security outfits warned severely against complaints and those who dared to complain further were mercilessly dealt with. Apostle Johnson Suleman is a good example. President Muhammadu Buhari’s fanatism for Islam is really alarming that he can do anything humanly possible to get everyone forcefully converted. Buhari was among the Islamic fanatics who conspicuously worked for the organisation of “Abuja Declaration” in 1989 and the more “militant” alternative declaration in 1990. Regarding the laters' declaration, it was agreed that; “Nigeria should become a Federal Islamic Sultanate and western law should be replaced with sharia”. In support of this continental plan of abolishing western values and laws, President Muhammadu Buhari on 27th August, 2001 stated “I will continue to show openly and inside me, the total commitment to Sharia movement that is sweeping all over Nigeria…God willing, we will not stop the agitation for the total implementation of the Sharia in the country (Buhari, 27-8- 2001). Islamization of people always go with the formation of mujahideen or jihadists, as one may choose to call it. Less than four years of Muhammadu Buhari’s call for total islamization of Nigeria in line with 1990 Declaration, Jama’atul Ahlis Sunnah Liddaáwati Wal Jihad aka Boko Haram was formed. The terrorist group stood against “western culture” as promulgated in 1990 Declaration. As the then government of Goodluck Ebele Jonathan was adopting military approach against the terrorist group who were seeking total Islamization of Nigeria, Buhari was again quoted as saying that “any fight against Boko Haram is war against the entire north”. On November 2012, Muhammadu Buhari was nominated by Boko Haram as one of their choice mediators though he distanced himself from the offer. Since his emergence as a president of Islamic Nigeria, there have been series of vicious circle of attacks on non-Islamic religions. His quest for spread of Islam all over the country knows no bound. In February 2016, while Buhari was on visit to Qatar, the minister of finance Mrs Femi Adeosun was intimidated into wearing a hijab. Today, haven achieved less than target, Buhari has chosen to forcefully implement the 1990 Declaration which states that “Nigeria should become a Federal Islamic Sultanate and western law should be replaced with sharia”. Nigeria is known for her practice of English Law, Common Law, and Customary law respectively. The practice of “Islamic Law” is for those from the few core northern states where Islam has foot print. The entire world and non-Muslims in Nigeria especially are yet to recover from the shock when during the trial of Mazi Nnamdi Kanu, Justice Binta Nyako, the presiding Judge asked Barr. Ifeanyi Ejiofor (Counsel to Mazi Nnamdi Kanu) if he knew anything about Sharia Law. The learned counsel answered negative in affirmation and confusion, wondering what Sharia law has got to do with his client's case. One would wonder what has sharia law got to do in a secular court with observance of Common Law. What looked like joke turned out serious when the presiding Judge made it known to the defense counsel that his client (Mazi Nnamdi Kanu and others) will be tried under Sharia law. She further stated that in sharia law, there lies an opportunity for secret trials. This is wonder of the century! Forcing non-Muslims to be tried under sharia law is the height of jihad ongoing in Buhari’s regime. Even when the accused through their counsels were trying to ask questions, they were shouted down by Kadi Binta Nyako. When has a Judge of federal High Court turned to Kadi of Sharia court? The statement by Kadi Binta Nyako that “even though thy kingdom come”, that the accused will be tried under Sharia law is of a jihadi mentality. This is how far Nigerian judiciary is messed up. If a popular figure like Mazi Nnamdi Kanu could be treated in such a way by Kadi Binta Nyako, what then happens to common Christians undergoing trials in the various courts. How will one not believe they are not being secretly tried under Sharia law? Buhari in his zeal to condemn Nnamdi Kanu and Islamize the entire nation is heading towards Central African Republic. The world should as a matter of urgency call Buhari to order before the entire Africa if not the world will be plunged into Armageddon. This is madness, I can't understand where this country is headed to, probably to total destruction. 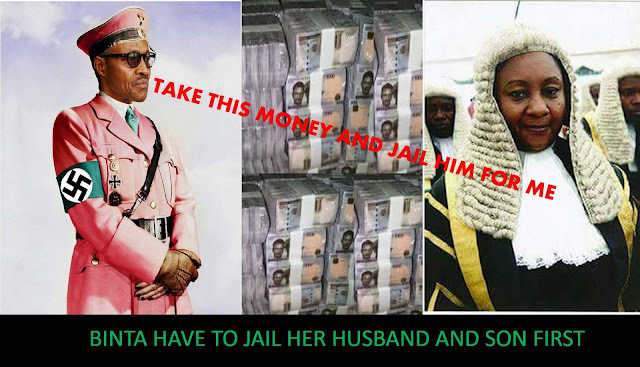 Binta and her brother Buhari have brought the entire contraption call Nigeria into laughable state of mockery. How shameful that British government, the Anglican Church or Church of England are all in the evil satanic agenda mix-up with the Muslim Islam jihadist against Biafra. The evil planted in Biafra-land by Britain, Hausa-Fulani, Yoruba, Barrack Hussein Obama shall be cast out of Biafra land and shall be return to sender!!! My people listen to me very carefully. It's time to unite and liberate our people and land from Islamic and murderous Nigeria. Now, it’s very clear to everyone that Nigeria is an Islamic State and islamization is for real. Biafra political leaders should read history of Islam conquest. Google and read. The primary purpose Buhari continued to run (4 times) to be president was to institutionalize Sharia and complete Islamic agenda which was started by IBB, Abacha and others. Sultan of Sokoto, Emir Sanusi, El-Rufia, Senator Kwankwaso and many other northern politicians and religious leaders are very angry with Buhari because he’s not enforcing the islamization as planned. Did you read the 36-page memo by El-Rufia to Buhari? It’s unfathomable how Biafrans do not see this satanic plan. The Yoruba SW are not worried. In fact more than half of Yoruba are still Muslim and even those who are Christians are also practicing Muslims. However, IPOB and entire Biafra must never allow their sons and daughters to be subjected to Sharia Law. We are not Muslims. Sharia is meant for Muslims. This is utter nonsense. Does this Judge think that we are Muslims? If truly Justice Binta Nyako said in the court of law that “every defending counsel must study Sharia Law, upon which Nnmadi and others must be tried,” then she must hand-off the case. She’s not qualified to handle such a high profile case. Nnamdi and company are not Muslims and Nigeria’s legal system is not based on Sharia law but Common Law. She should resign and hand-over the case now. IPOB lawyers and leadership must never allow her to continue with this highly profile case. Enough is enough in this failed and evil contraption called Nigeria. They should let Biafra go period!